In the post-war years, when it was still somewhat unusual for a family to have two cars, independent American manufacturers like Crosley and Nash saw an opportunity to compete where the Big 3 weren’t playing. This resulted in an interesting, if rather odd, selection of cars with big-car cues (or lack of any style at all) applied to small cars. They also lacked big-car power, of course, but the idea was that short runs to town could be accomplished in something better suited to one person. 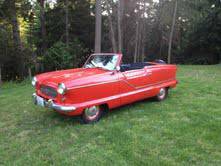 Check out this 1958 Nash Metropolitan for sale for $3400 in Stanwood, WA. This single-tone color actually works better than some of the over-the-top two-tone schemes offered on these cars. This car is said to be a coupe with a removable top, and the seller says he has all components. It’s not quite clear what that means, for these cars were available as coupes and convertibles, and this appears to be a homemade conversion. There were hardtops offered in the aftermarket for these, so perhaps it’s a convertible with the soft top removed? The car is said to start and run well, and has a new windshield & gasket, tires, brakes, shocks, and leaf springs. Unfortunately, the pictures are rather blurry, so it’s hard to assess the condition, apart from the fact that a sofa cover on the front seats suggests the upholstery needs replacement. The monotone really takes away from the bulbous look that made these look rather cartoonish. A nice glossy paint job in a dark color might make it look downright elegant. The seller suggests hot rodding, probably thinking of the conventional V8 method, but much more fun could be had modifying the 1500cc B-series engine (same as the MGA? yes, same as the MGA), either by upgrading to a larger version. Hmm, or how about an MGA twincam head? Moss supercharger kit? You could have all kinds of fun here, and terrify yourself and others in the process. This entry was posted on February 5, 2014 at 1:11 pm and is filed under Feature. You can follow any responses to this entry through the RSS 2.0 feed. You can leave a response, or trackback from your own site. The roof being hacked off is a pity; pretty much makes this a parts car.